Entrepreneur Valerie had chosen an awesome coach, Ursula, to be her business mentor. They were making long-term plans for Valerie’s own consulting business. Coach Ursula encouraged Valerie to map out a full year of events and activities, with something big every month. One month she would hold a webinar. The next month she’d promote a workshop. In another month she’d unveil a home study course. Valerie loved the program. She had just one problem. She seemed to take forever to write her sales letters and landing pages. Her 7-Step Signature System kept getting pushed back because she couldn’t seem to come up with an outline, let alone the content.One day Valerie was browsing LinkedIn when she came across a post by a copywriter named Jim. Jim’s article presented some intriguing tips for writing sales letters, blog posts, and landing pages. Valerie realized she could use some of these tips, especially when she created her 7-Step Signature Program. But Valerie hesitated. She was already paying significantly for her mentor coach. She wondered what would happen if Coach Jim suggested strategies that would conflict with Coach Ursula’s advice. She felt disloyal: was she suggesting that Coach Ursula couldn’t satisfy all her business needs? In the end, Valerie set up a consultation with Coach Jim. After just a couple of sessions, she had created and sold her signature program – more than compensating for her costs. She had learned a new way to write sales letters so she could complete each month’s project on time. Valerie began to get more out of her coaching sessions with Ursula. 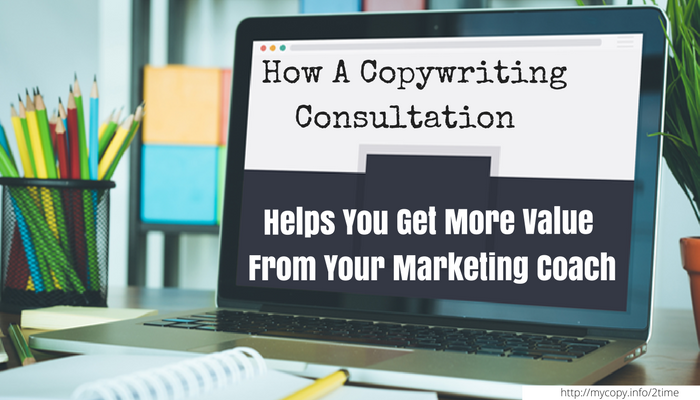 She discovered 4 ways her copywriting consultation was helping to accelerate her marketing. (1) She wasn’t afraid to take on bigger projects because she knew she could sell them. (2) She was more confident moving forward with new projects, because she knew how to test their marketability by writing a sales letter. (3) Because she had resources for copywriting, she was able to concentrate her sessions with Ursula on broader questions, such as shifting her mindset, planning her next six months and making key connections in her field. (4) She discovered how to engage her clients with conversational copywriting and storytelling, so she began seeing greater results even without increasing her traffic. When her new ideas came into conflict with Ursula’s suggestions (which was very rare), she pointed to her results. Ursula was a pretty good marketing coach after all. 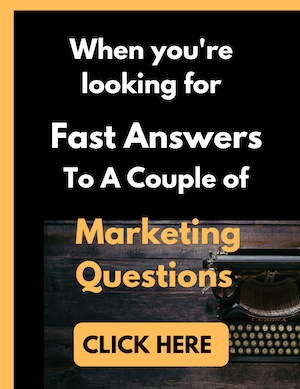 By the way, most business owners don’t want to be copywriters — but they do want to be able to write drafts and confer knowledgeably with their copywriters. To help you accomplish these goals, I’ve created the affordably priced course, Copywriting for Non-Copywriters on Udemy. Click here to claim a 50% discount. If you’re on deadline and need help with your copy right now, check out the Story Consultation. We’ll find the story behind your brand and create some powerful copy right before your eyes. And if you’re a marketing coach who’d like to refer someone to me, visit this page.